With 36 volts of power, a top speed of up to 18 mph, a range of up to 20 miles on a single charge, and lots of torque, the SX and LE model E-Bikes will get you where you need to go! Especially designed for hill climbing and added acceleration, the SX, LE, and LE Touring bikes are perfect for those who enjoy riding but occasionally want a little powered assistance when needed. The power-on-demand system provides instant acceleration without pedaling and sustained speed when needed or just for fun. Just press the throttle to engage the motor and you’re on your way! Safety features include a 35-watt halogen headlight, LED brake light, electric horn, and rear-view mirror. The SX model, built for the more active rider and moderately rugged terrain, is the SUV of E-Bikes. It has all of the features of the standard LE model including the following: triple-clamp fork front suspension, high-performance front disc brake, sport alloy handlebar and stem, suspension seat post, sport fenders, and high efficiency puncture-resistant tires. For your convenience, each model has a removable and rechargeable battery pack. 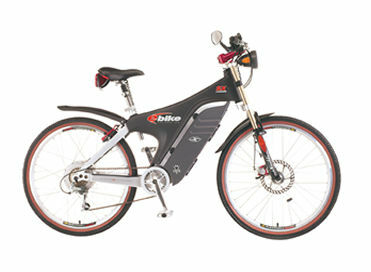 You can charge the battery in or out of the bike in 4 hours by plugging it into a standard 110-volt wall outlet. -Limited One (1) Year Warranty Specifications subject to change. original owner. Battery carries six-month warranty.